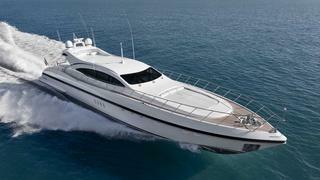 The 33.5 metre motor yacht King has been listed for sale by Marco Fodale at Camper & Nicholsons International. Designed by Andrea Bacigalupo, she was built in GRP by Italian yard Overmarine to Bureau Veritas class and delivered in 2004 as a Mangusta 108’ model with a refit in 2018. Accommodation is for nine guests in a master suite, VIP suite, a double and a triple cabin, all with entertainment centres, television screens and en suite bathroom facilities. The spacious aft deck of this yacht for sale has an al fresco entertaining and dining area for up to eight guests and comes complete with a Jacuzzi spa tub. There are stereo audio systems in this area and also on the sun deck which has sun pads and sun loungers. In addition, there is a large sun pad on the foredeck offering sunbathing in unparalleled privacy away from prying eyes on the dock. As with all Mangusta models, speed is a vital consideration and King certainly lives up to expectations, with twin 2,750hp MTU engines linked to a pair of KaMeWa water jets powering her to a cruising speed of 33 knots, topping out at 38 knots. Lying in Monaco, King is asking €2,970,000.